"Linear transformation" redirects here. For fractional linear transformations, see Möbius transformation. Not to be confused with linear function. An important special case is when V = W, in which case the map is called a linear operator, or an endomorphism of V. Sometimes the term linear function has the same meaning as linear map, while in analytic geometry it does not. A linear map always maps linear subspaces onto linear subspaces (possibly of a lower dimension); for instance it maps a plane through the origin to a plane, straight line or point. Linear maps can often be represented as matrices, and simple examples include rotation and reflection linear transformations. In the language of abstract algebra, a linear map is a module homomorphism. In the language of category theory it is a morphism in the category of modules over a given ring. Thus, a linear map is said to be operation preserving. In other words, it does not matter whether the linear map is applied before or after the operations of addition and scalar multiplication. viewed as a vector space over itself is called a linear functional. without modification, and to any right-module upon reversing of the scalar multiplication. The zero map x ↦ 0 between two left-modules (or two right-modules) over the same ring is always linear. The identity map on any module is a linear operator. where c is a scalar, is a linear operator. This does not hold in general for modules, where such a map might only be semilinear. For real numbers, the map x ↦ x2 is not linear. If A is a real m × n matrix, then A defines a linear map from Rn to Rm by sending the column vector x ∈ Rn to the column vector Ax ∈ Rm. Conversely, any linear map between finite-dimensional vector spaces can be represented in this manner; see the following section. Differentiation defines a linear map from the space of all differentiable functions to the space of all functions. It also defines a linear operator on the space of all smooth functions. The (definite) integral over some interval I is a linear map from the space of all real-valued integrable functions on I to R.
If V and W are finite-dimensional vector spaces over a field F, then functions that send linear maps f : V → W to dimF(W) × dimF(V) matrices in the way described in the sequel are themselves linear maps (indeed linear isomorphisms). The expected value of a random variable (which is in fact a function, and as such a member of a vector space) is linear, as for random variables X and Y we have E[X + Y] = E[X] + E[Y] and E[aX] = aE[X], but the variance of a random variable is not linear. If V and W are finite-dimensional vector spaces and a basis is defined for each vector space, then every linear map from V to W can be represented by a matrix. This is useful because it allows concrete calculations. Matrices yield examples of linear maps: if A is a real m × n matrix, then f(x) = Ax describes a linear map Rn → Rm (see Euclidean space). where M is the matrix of f. In other words, every column j = 1, …, n has a corresponding vector f(vj) whose coordinates a1j, …, amj are the elements of column j. A single linear map may be represented by many matrices. This is because the values of the elements of a matrix depend on the bases chosen. The composition of linear maps is linear: if f : V → W and g : W → Z are linear, then so is their composition g ∘ f : V → Z. It follows from this that the class of all vector spaces over a given field K, together with K-linear maps as morphisms, forms a category. The inverse of a linear map, when defined, is again a linear map. If f1 : V → W and f2 : V → W are linear, then so is their pointwise sum f1 + f2 (which is defined by (f1 + f2)(x) = f1(x) + f2(x)). If f : V → W is linear and a is an element of the ground field K, then the map af, defined by (af)(x) = a(f(x)), is also linear. Thus the set L(V, W) of linear maps from V to W itself forms a vector space over K, sometimes denoted Hom(V, W). Furthermore, in the case that V = W, this vector space (denoted End(V)) is an associative algebra under composition of maps, since the composition of two linear maps is again a linear map, and the composition of maps is always associative. This case is discussed in more detail below. Given again the finite-dimensional case, if bases have been chosen, then the composition of linear maps corresponds to the matrix multiplication, the addition of linear maps corresponds to the matrix addition, and the multiplication of linear maps with scalars corresponds to the multiplication of matrices with scalars. A linear transformation f: V → V is an endomorphism of V; the set of all such endomorphisms End(V) together with addition, composition and scalar multiplication as defined above forms an associative algebra with identity element over the field K (and in particular a ring). The multiplicative identity element of this algebra is the identity map id: V → V.
An endomorphism of V that is also an isomorphism is called an automorphism of V. The composition of two automorphisms is again an automorphism, and the set of all automorphisms of V forms a group, the automorphism group of V which is denoted by Aut(V) or GL(V). Since the automorphisms are precisely those endomorphisms which possess inverses under composition, Aut(V) is the group of units in the ring End(V). If V has finite dimension n, then End(V) is isomorphic to the associative algebra of all n × n matrices with entries in K. The automorphism group of V is isomorphic to the general linear group GL(n, K) of all n × n invertible matrices with entries in K.
The number dim(im(f)) is also called the rank of f and written as rank(f), or sometimes, ρ(f); the number dim(ker(f)) is called the nullity of f and written as null(f) or ν(f). If V and W are finite-dimensional, bases have been chosen and f is represented by the matrix A, then the rank and nullity of f are equal to the rank and nullity of the matrix A, respectively. the co-kernel is the space of constraints that must be satisfied if the equation is to have a solution, and its dimension is the number of constraints that must be satisfied for the equation to have a solution. The dimension of the co-kernel and the dimension of the image (the rank) add up to the dimension of the target space. For finite dimensions, this means that the dimension of the quotient space W/f(V) is the dimension of the target space minus the dimension of the image. given a vector (a, b), the value of a is the obstruction to there being a solution. with cn = an + 1. Its image is the entire target space, and hence its co-kernel has dimension 0, but since it maps all sequences in which only the first element is non-zero to the zero sequence, its kernel has dimension 1.
namely the degrees of freedom minus the number of constraints. For a transformation between finite-dimensional vector spaces, this is just the difference dim(V) − dim(W), by rank–nullity. This gives an indication of how many solutions or how many constraints one has: if mapping from a larger space to a smaller one, the map may be onto, and thus will have degrees of freedom even without constraints. Conversely, if mapping from a smaller space to a larger one, the map cannot be onto, and thus one will have constraints even without degrees of freedom. The index of an operator is precisely the Euler characteristic of the 2-term complex 0 → V → W → 0. In operator theory, the index of Fredholm operators is an object of study, with a major result being the Atiyah–Singer index theorem. No classification of linear maps could hope to be exhaustive. The following incomplete list enumerates some important classifications that do not require any additional structure on the vector space. Let V and W denote vector spaces over a field, F. Let T: V → W be a linear map. T is one-to-one as a map of sets. T is monic or left-cancellable, which is to say, for any vector space U and any pair of linear maps R: U → V and S: U → V, the equation TR = TS implies R = S.
T is left-invertible, which is to say there exists a linear map S: W → V such that ST is the identity map on V.
T is onto as a map of sets. T is epic or right-cancellable, which is to say, for any vector space U and any pair of linear maps R: W → U and S: W → U, the equation RT = ST implies R = S.
T is right-invertible, which is to say there exists a linear map S: W → V such that TS is the identity map on W.
T is said to be an isomorphism if it is both left- and right-invertible. This is equivalent to T being both one-to-one and onto (a bijection of sets) or also to T being both epic and monic, and so being a bimorphism. If, for some positive integer n, the n-th iterate of T, Tn, is identically zero, then T is said to be nilpotent. If T = kI, where k is some scalar, then T is said to be a scaling transformation or scalar multiplication map; see scalar matrix. Given a linear map which is an endomorphism whose matrix is A, in the basis B of the space it transforms vector coordinates [u] as [v] = A[u]. As vectors change with the inverse of B (vectors are contravariant) its inverse transformation is [v] = B[v']. Therefore, the matrix in the new basis is A′ = B−1AB, being B the matrix of the given basis. Therefore, linear maps are said to be 1-co- 1-contra-variant objects, or type (1, 1) tensors. 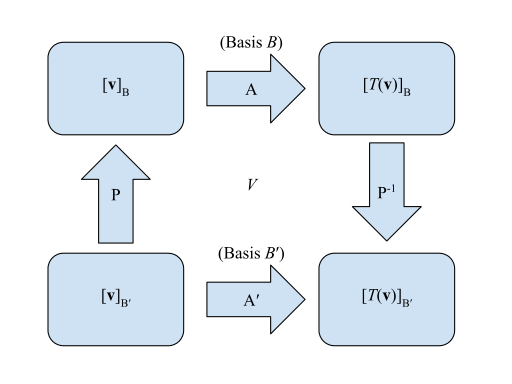 A linear transformation between topological vector spaces, for example normed spaces, may be continuous. If its domain and codomain are the same, it will then be a continuous linear operator. A linear operator on a normed linear space is continuous if and only if it is bounded, for example, when the domain is finite-dimensional. An infinite-dimensional domain may have discontinuous linear operators. An example of an unbounded, hence discontinuous, linear transformation is differentiation on the space of smooth functions equipped with the supremum norm (a function with small values can have a derivative with large values, while the derivative of 0 is 0). For a specific example, sin(nx)/n converges to 0, but its derivative cos(nx) does not, so differentiation is not continuous at 0 (and by a variation of this argument, it is not continuous anywhere). A specific application of linear maps is for geometric transformations, such as those performed in computer graphics, where the translation, rotation and scaling of 2D or 3D objects is performed by the use of a transformation matrix. Linear mappings also are used as a mechanism for describing change: for example in calculus correspond to derivatives; or in relativity, used as a device to keep track of the local transformations of reference frames. Another application of these transformations is in compiler optimizations of nested-loop code, and in parallelizing compiler techniques. ^ Rudin 1991, p. 14. Linear mappings of X onto its scalar field are called linear functionals. ^ Nistor, Victor (2001) , "Index theory", in Hazewinkel, Michiel, Encyclopedia of Mathematics, Springer Science+Business Media B.V. / Kluwer Academic Publishers, ISBN 978-1-55608-010-4 : "The main question in index theory is to provide index formulas for classes of Fredholm operators ... Index theory has become a subject on its own only after M. F. Atiyah and I. Singer published their index theorems"
is not dense in X.
is bounded in some neighbourhood V of 0. Halmos, Paul R. (1974). Finite-Dimensional Vector Spaces. New York: Springer-Verlag. ISBN 0-387-90093-4. Horn, Roger A.; Johnson, Charles R. (2013). Matrix Analysis (Second ed.). Cambridge University Press. ISBN 978-0-521-83940-2. Rudin, Walter (1976). Principles of Mathematical Analysis (Third ed.). McGraw-Hill. ISBN 0-07-085613-3. Rudin, Walter (1991). Functional Analysis (Second ed.). McGraw-Hill. ISBN 0-07-054236-8.